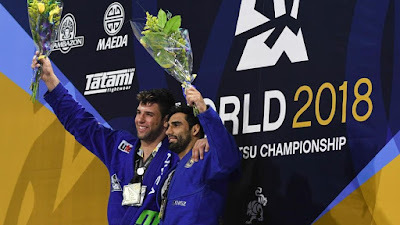 After injuring his shoulder in the super-heavyweight final, Leandro Lo was given a consolation prize by his close friend Marcus Buchecha in the form of absolute gold. Lo injured his shoulder in his super-heavyweight final match with Mahamed Aly, suffering two inferior dislocations with the space of a few minutes. The shoulder was put back in place by the medics both times, but the injury was too much for Lo to continue with an Aly was declare default winner. When it was time for the absolute final there was an uncertainty in the air. Buchecha had already won the ultra-heavyweight gold, making history by giving him a total of 11 IBJJF World gold medals. With his arm tucked in his gi and packed with ice, Lo walked onto the mat with Buchecha. Nobody knew what would happen, but the referee raised Lo’s hand. Buchecha decided to give Lo a present that will remain on his resume forever, that of absolute champion.